The possibility of a house fire is a frightening prospect to any homeowner. There are lots of measures that can be taken to drastically decrease the risk of a fire ever occurring. However, even after you’ve taken all those measures, freak accidents just happen sometimes. It can be a very big deal when having to take care of the fire damage repair and restoration that goes into recovering from a fire. Which is why it is important to reach out to certified and insured professionals that have been trained to clean up and repair properties from fire damage. Professionals like RestorePro in Sandusky, Ohio can restore your home fast, and help resolve your stress and anxiety. Another way to reduce your stress is to prepare responsibly for a fire emergency in your home. This is an especially important measure to take for families. A simple, yet comprehensive plan for escaping the house during a fire should be understood by the whole family. Doing this will help you sleep easier knowing that everyone in your family is on the same page. This is something that you’ve probably heard a thousand times, but that’s just because it’s so important. Don’t worry about possessions or anything else material that will hold you back from getting out quickly. Just get out of the house. Try to not inhale as much smoke as possible. The more smoke you inhale the less clearly you’ll be able to think and the less stamina you’ll have to find your way out. As we’ve all been taught, smoke rises, so stay low to the ground and use something to cover your mouth if you can to filter the smoke out. The worst-case scenario for being caught in a fire is being trapped on an upper level of the house with the fire below you. If this happens to you, the best course of action to take if you can’t get out through the window is fortify yourself in from the fire and wait for help. Smoke will be the first thing to reach you and it will be important to cover all the vents and openings into the room. This will protect you from the smoke and allow you to breathe cleaner air for a longer period of time. Once you’ve done that, the next thing you’ve got to do is get to a window and call for help. The fire department should be there within a few minutes. They will be able to rescue you out from the window and pull you clear of the fire. By being smart in a house fire emergency and following these suggestions you will be as safe as possible from this threat. 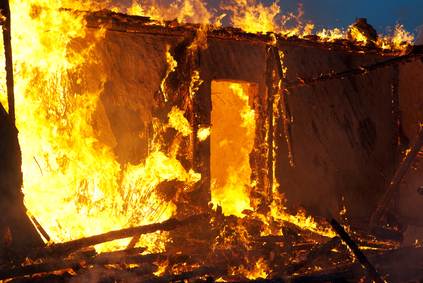 In the wake of the fire, don’t waste any time before calling in a professional fire restoration team like RestorePro in Sandusky for your fire damage repair and restoration needs.